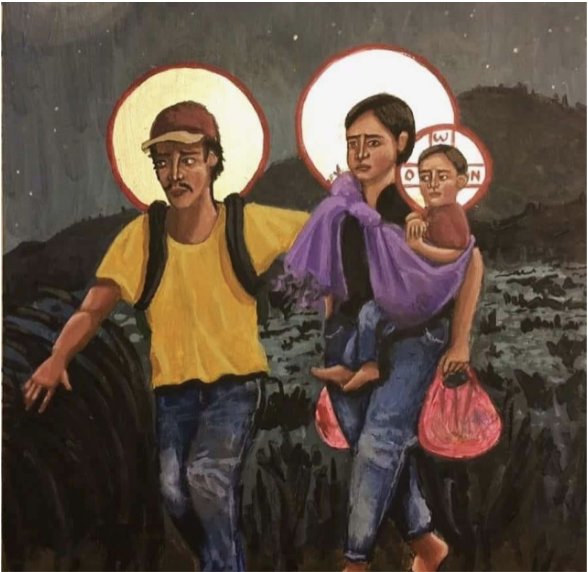 Note: The story below is written by a leader in one of the General Commission on Archives and History’s most important ventures---The Committee for the Study of the Hispanic/Latino United Methodist Church. Dr. David Maldonado (with Bishop Joel Martinez) was the recipient of GCAH’s Distinguished Service Award for 2018, honored for gathering, promoting and interpreting the stories of Hispanic/Latino Church within the historic Methodist and United Methodist traditions. There is no more timely, poignant and pertinent story for one to reflect upon as this past Christmas becomes a memory. As you lovingly box and stow away your nativity set for another year, please keep this story and image in mind. Fred Day – General Commission on Archives and History, General Secretary. A Post Christmas Story by Dr. David Maldonado, Jr.
“Who is it?” she asked in a whisper. A male voice from within the house responded in a loud irritated voice as if wanting to be heard by the travelers standing outside the door. “Maybe they will be more welcoming,” cried the young pregnant woman. This time, the door opened slightly. “Who are you? What do you want? Where are you from?” the voice called from within the slightly opened door. “We just arrived and our child is ready to be born,” responded the young father-to-be. “Humph! Some more of them. They just cause problems for the rest of us. I wish they would stop coming. I wish they would just leave. Our whole town is changing because of them, but I could sure use his cheap labor in the morning. They are good workers. Hope nobody is looking,” thought the man from behind the door.